Our group has recently been equipped with a new Phasespace Impulse X2 motion capture system with active LEDs and a 3-wall immersive virtual reality set-up. The Phasespace Impulse X2 system uses 8 cameras that are able to capture 3D motion using modulated LEDs. These cameras contain a pair of linear scanner arrays operating at high frequency each of which can capture the position of any number of bright spots of light as generated by the LEDs. The system offers a fast rate of capture (480Hz) and allows the individual markers to be identified by combining the information from several frames and hence identifying the marker from its unique modulation. Our system is able to capture 3D motion data over time of a single character, maintaining the correct human proportions and the naturalness of the action, while having a realistic motion. 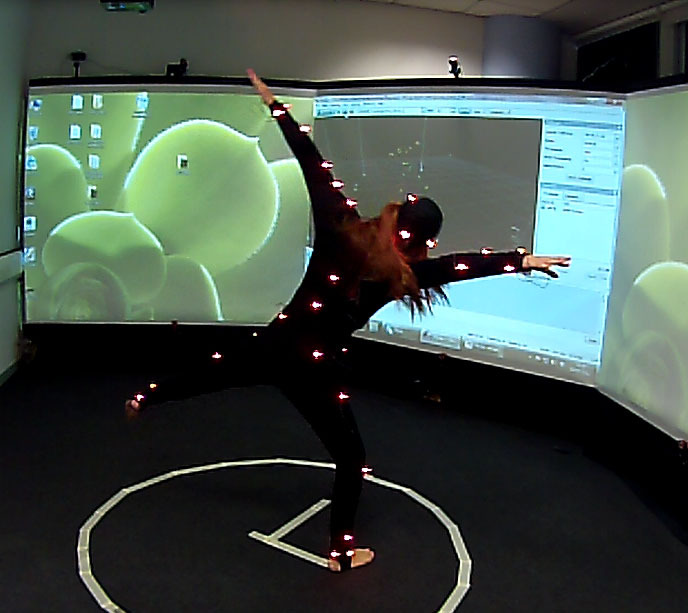 The system also offers mobility enabling motion capture sessions to be performed at dance schools and studios.